Inspired by the dried flowers found pressed between the pages of scrapbooks donated to our collection, EVERY SUMMER HAS A LOVE STORY is our contribution to this year’s citywide celebration of the fiftieth anniversary of The Summer of Love. Since the scope of our collection (California, pre-statehood through World War I) excludes most of the twentieth century, we are certainly taking liberties here. Still, within our archives are reminders that San Francisco has always attracted those looking for a new way of life. It has always been a place where dreamers are welcome and expressions of love are encouraged. Since summer days feel more ephemeral than others, it seems fitting to highlight selections from our eclectic collection of ephemera in this exhibition. 1867 was the midpoint of the Victorian Era and San Francisco was where recent immigrants, members of high society, and the nuevo riche mingled; both commerce and romance followed. Conflict within families between the generations, protest marches, and racial tension also followed, much as they did one-hundred years later. Despite this, popular culture in 1867 is populated with mischievous children and sweet young girls who become blushing brides, as well as the promise of a brighter future for all. This exhibition is a sampler of examples of this, drawn from the archives at The Society of California Pioneers. The year 1867, although 150 years ago, had many activities and items that were related to lovers, romance and all things associated with the idea of love. Many of the materials in our collections that relate to these activities fall under the category of “ephemera”. The word “ephemera” means any transitory written or printed matter, not meant to be retained or preserved. The word is derived from the Greek word ephemeros, meaning “lasting only one day, or short lived”. As ephemeral the items may be, their importance in research is not so. Many of these items give a glimpse into the day-to-day lives of people during a particular time period and in a particular place. Without these items, we would never know what images caught people’s eyes, what entertainments they attended, and many other common activities of everyday life. This online exhibit hopefully shows what lovers in the summer of 1867 were doing—in some ways not very different that 150 years later during The Summer of Love in 1967! City Directories – a clue to what the summer of 1867 was like…….. 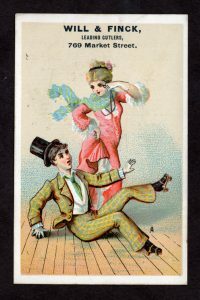 The year 1867 in San Francisco—as seen through it’s City Directories, trade cards, valentines and other items of ephemera—is shown to be a place where entertainments such as roller skating, attending a musical event or play, or indulging in chocolates and oysters were some of the popular things to do. 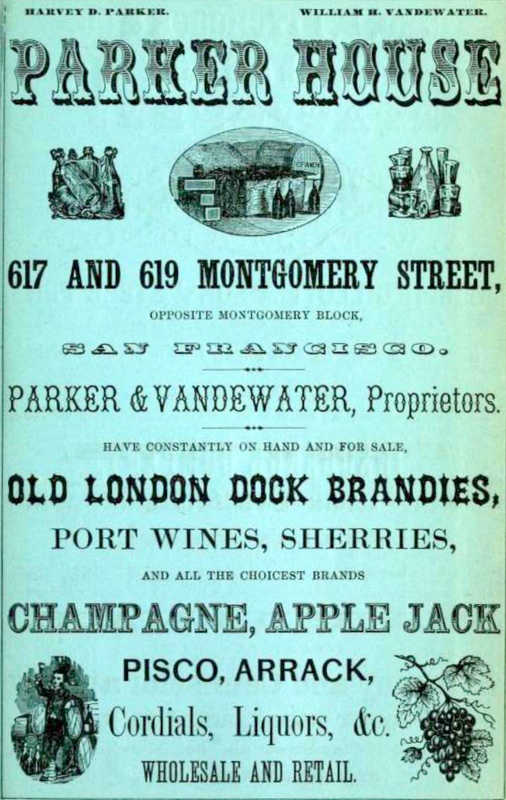 Advertisements in San Francisco city directories, such as those shown below, – all from the collection at the Society’s library – proclaim some of the more popular places in the city to eat and drink with, and buy gifts for your loved one. The Parker House, opposite the Montgomery Block, sold all varieties of drink to share with your better half—Champagne, Apple Jack, Pisco (a brandy made from Peruvian grapes, used to make Pisco Punch), and Arrack (alcohol made from Sugar Cane and the fermented sap of coconut flowers and often flavored with Anise). This advertisement clearly shows the tastes in liquors of the day—even as exotic as Arrack, which was an alcohol popular in Southern Asia. Geo C. Shreve & Company, still in existence today, was the place to go for a small gift of jewelry for your loved one. Established in 1852 by George C. Shreve and his nephew Samuel, who had moved to San Francisco from New York. 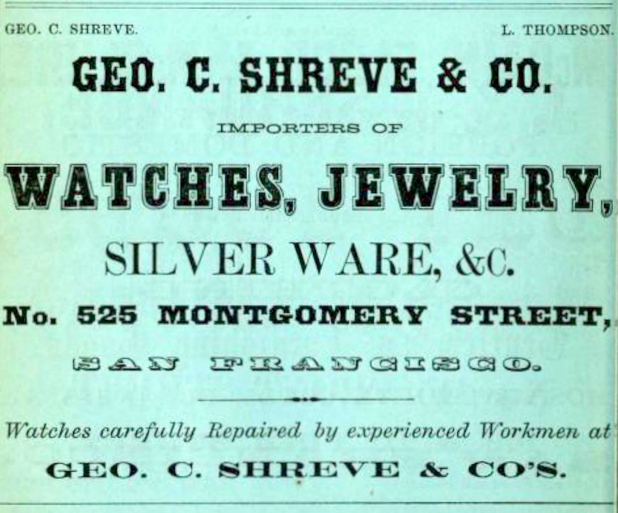 They opened a jewelry store, The Shreve Jewelry Store, at Montgomery and Clay, hoping to capitalize on the influx of wealth into San Francisco from the Gold Rush. By 1867, as seen in this ad, the company had expanded to sell not only jewelry and watches, but silverware, too. It also notes the then co-owner, L. Thompson. 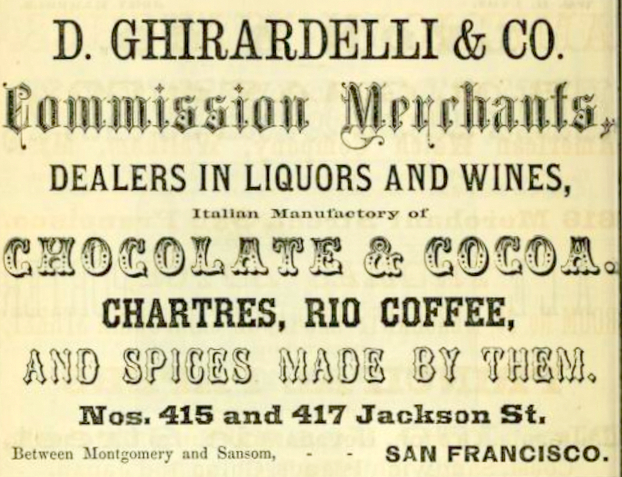 And, for chocolates—as well as liquor!—for your loved one, the place to shop was D. Ghirardelli & Co., on Jackson Street between Montgomery and Sansome. Founded by Domenico Ghirardelli, in 1849 he first opened a general store for miners in Stockton, and then he opened a second store in San Francisco, the same year, on Broadway and Battery. This advertisement, from the 1867 San Francisco City Directory, reflects some of the items originally sold in 1849 —showing not only chocolate for sale, but liquors, wines, and coffee and spices. It notes the Italian Manufactory of Chocolate & Cocoa—reflecting Domenico’s apprenticeship with a candy maker in his home town of Rapallo, Italy. 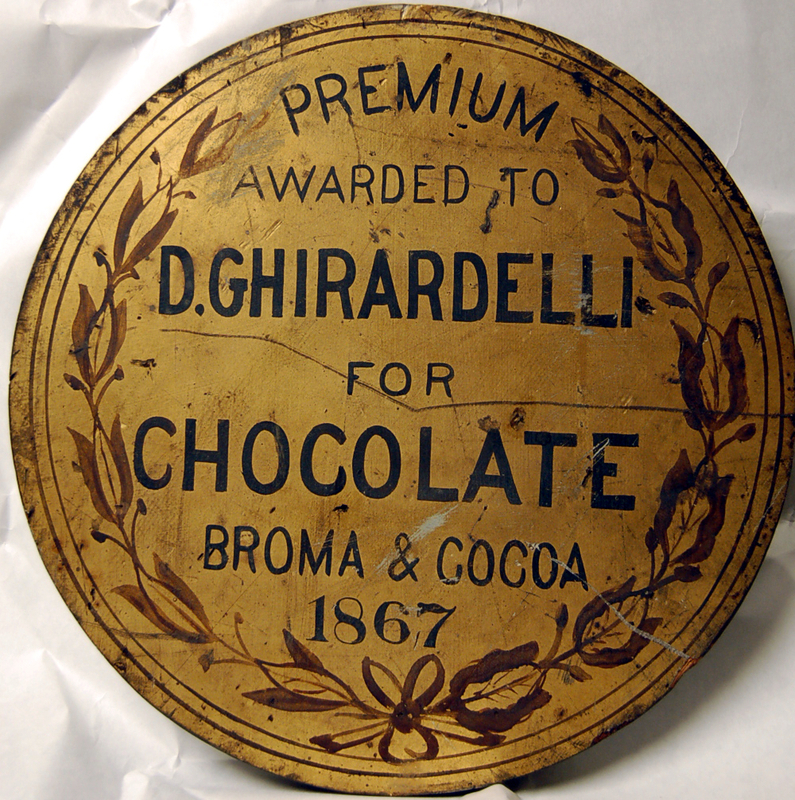 This old sign notes the award to Ghirardelli for Broma and Cocoa—broma being the process discovered by an employee—hanging a chocolate mass in a warm room, producing a residue that was then processed into ground chocolate—which produced a richer chocolate. Although city directories were printed, and went out of date when the following year was published—they generally were not thrown away. But items such as trade cards, and dance cards were, for the most part, discarded. But, thanks to libraries and archives, many of these wonderful items have survived to aid researchers today. 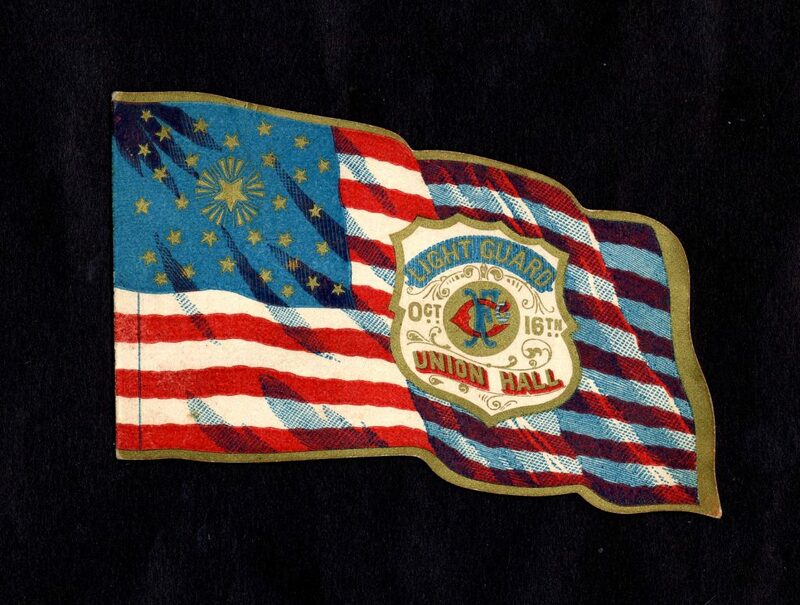 This dance card from 1867, is typical of many in that the outside related to the organization which held the dance—here is shown a flag, with the initials, K O C—referring to Knights of Columbus. Once inside the card, one can see what the popular dances of the day were…. While a March may have been played to open the dance, Quadrilles were a popular dance in the 19th century—similar to a square dance. 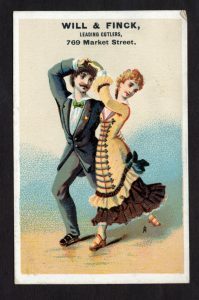 And the Waltz, Polka and the Schottische were also common dances in the 19th century as well. The Masourka was another type of dance—danced to music which was also termed Masourka, a Polish dance. One wrote the name of the gentleman on the line by the dance…. lucky ladies usually had their dance card filled!. Trade cards were one of the earliest forms of publicity for a business. Their origins date from the early 17th century—when it was only a slip of paper, printed with the business name, trade and location. 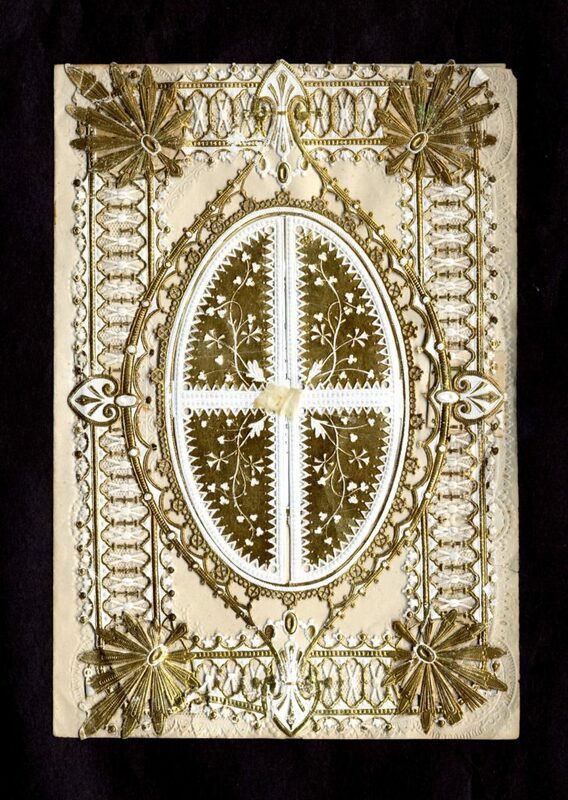 In the 18th and 19th centuries, it developed into an actual card. It originally was printed in black, with an engraving incorporating the sign of the proprietor’s trade or premises. The late 19th century brought the increasing use of illustration—sometimes an image of the firm’s premises, sometimes the product—sometimes shown in a scene incorporating the product. These two cards, advertising Will & Finck cutlery—show one increasing popular use for cutlery—that of blades for ice skates. The above cards illustrate both forms of skating – ice skating on the right, and on the left, roller skating. Ice skating in San Francisco was not at all common—there is a record that in 1888, people were seen skating on a pond in Golden Gate Park—but the roller skating craze of the late 19th century was to be seen in San Francisco. There were roller rinks in the city—and in fact, after the 1906 earthquake, the Mechanics’ Pavilion, then a roller rink, was destroyed. The stock of skates held there were distributed, and many people used them on the bottom of heavy objects, to move their belongings along the street. 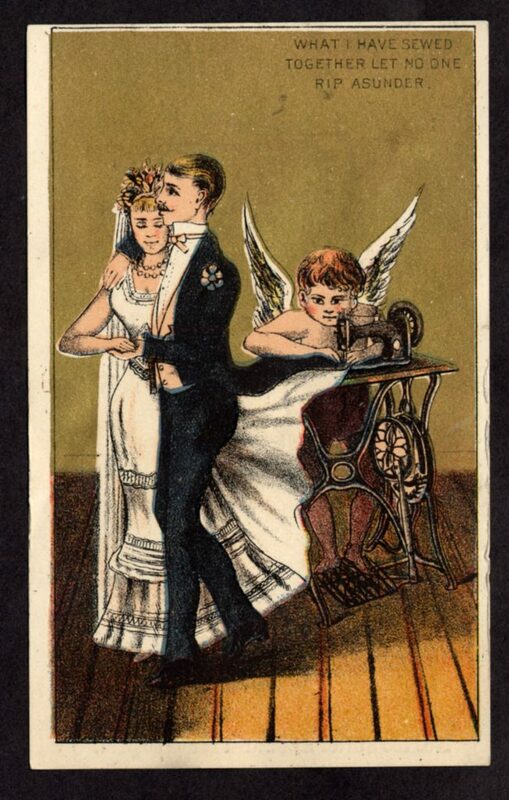 This card above, the proprietor’s name now lost, advertises a brand of sewing machine—and cleverly quotes on the top, “What I have sewed together let no one rip asunder” shown next to a bride and groom. The style of dress, in both the man and woman, illustrates what would have been the fashion at that time. 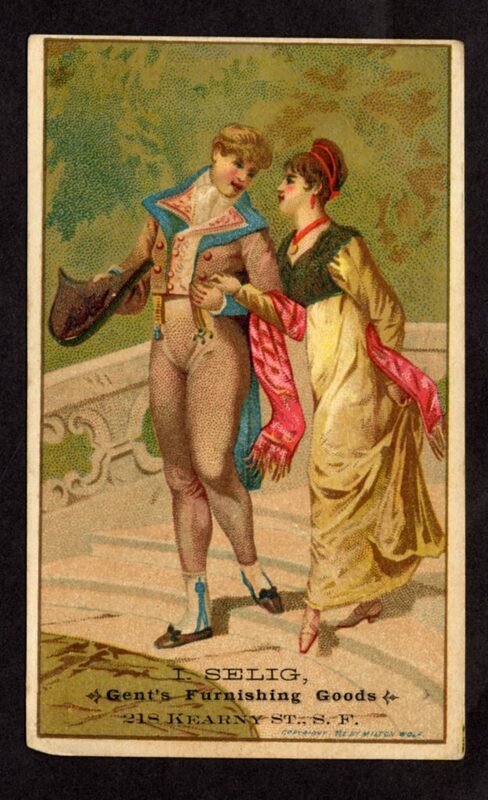 Although, this trade card—for a store selling “Gent’s Furnishings”, or men’s clothing—certainly does not illustrate the dress of the time—more like that of the 18th century. But, it does give the name of the business and the address. Many trade cards were issued in series, and were collected and then pasted in scrapbooks. Many of the cards in our collection can be found in these 19th century scrapbooks. Cards were also made in the shape of the items sold—such as shoes, hats, chairs and shirts—but we have none specifically from the 1860s in our collection. But, many of the cards were often not dated. This last card, for S. & G. Gump, the forerunner of the Gump’s store that still exists today—really does not advertise any of their products. 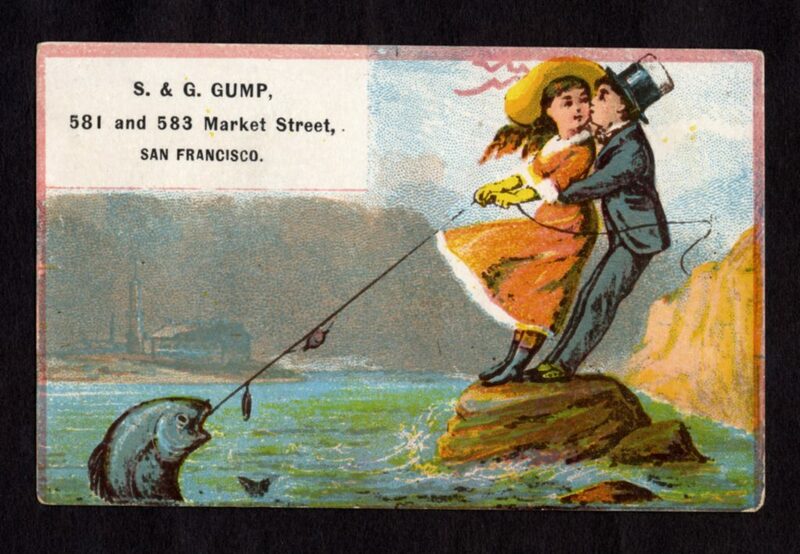 By showing a couple fishing, and the young man stealing a kiss while the woman catches a fish—the card is only advertising any the name and location of the business. There were probably other cards in this series—perhaps illustrating other sports. Gump’s was founded in 1861 as S. & G. Gump—by Gertrude Gump and her husband. They were soon joined by the Gump brothers, Solomon and Gustave, who bought the enterprise—this card dates from their ownership in the 1860s. Valentines date from the 1840s in Britain, when the Uniform Penny Post act enabled all classes of the public to send messages to one another at a moderate cost. In America, the idea became popular in the 1850s and 1860s – especially when the imports of lace paper began. The Lace paper industry was popularized by the firm of Dobbs Kidd in London, but soon was seen in America. 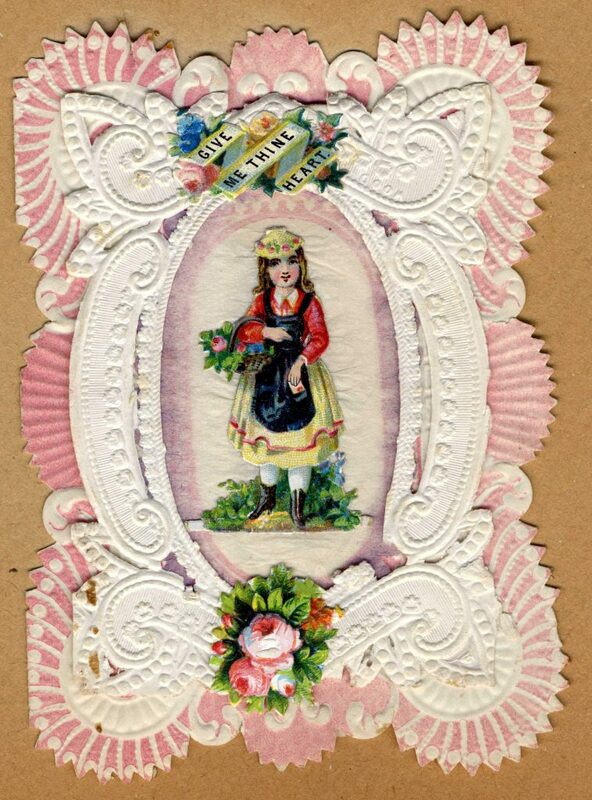 Young women assembled the valentines, which were often multi-layered, and created a three-dimensional card. 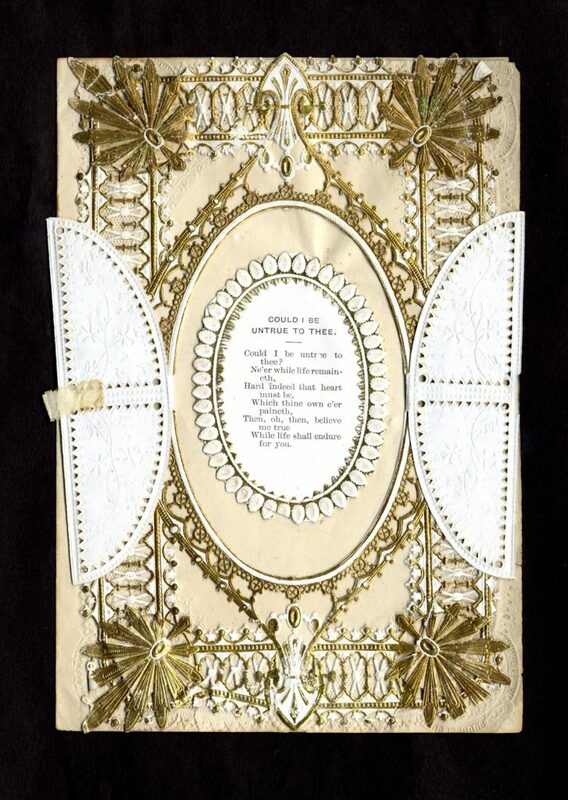 To lace were added silk, printed poems, artificial flowers, and often chromolithographed images called “scraps” or “diecuts” of flowers, angels, girls, animals and lovers. The term “die” refers to the process of using a specialized tool, called a die, to cut or shape material. In this case it was paper that was being cut into shapes and images of a wide variety of things – people, flowers, animals and symbols. This valentine, has a hidden poem, which appears when one opens out the lace. The back and front are both embellished with gold paper lace. 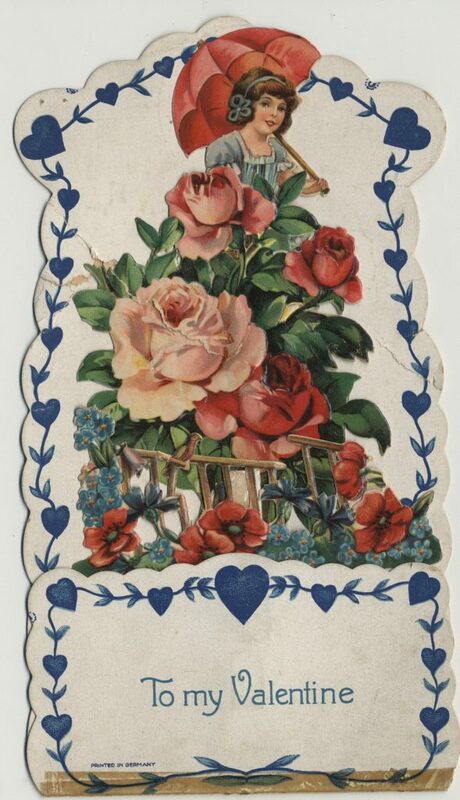 “To My Valentine”, illustrates the popular work of chromolithography – often imported from Germany as this card was. The Victorian “scrap” or “Die-cut” was one of the major outlets for the work of the chromolitho printer. At first produced only in Germany, the diecuts also had embossed reliefs. They were sold separately or in sheets. Many of these scraps, which became fashionable with children and adults alike, were collected and pasted into a scrap album – or scrapbook. One of the most prominent printers of scraps in America was Louis Prang, of Boston – whose name lives on today in watercolor sets for children. And, finally, “Give me thine Heart”, utilizes both lace, die-cutting and embossing…producing a very elaborate Valentine – suitable for your sweetheart. 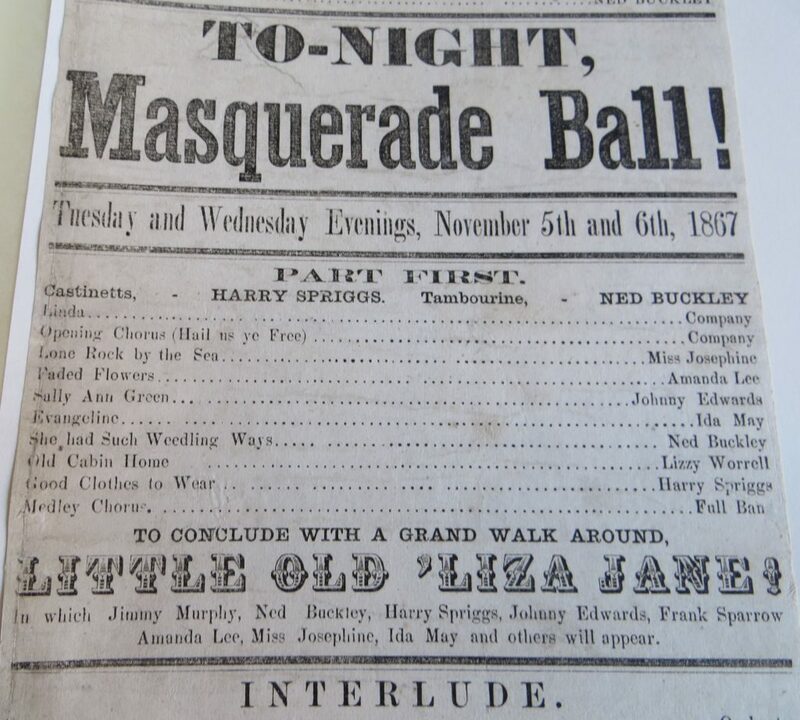 And, last but not least, the event to which you took your valentine, or loved one – plays, dances, and masquerade balls – were all advertised to the public by either broadsides (pasted up on buildings or poles), or handbills (handed out to the public by men, or women hired for the purpose). One could choose highbrow theatre or music – Shakespeare or the Opera – or one could go for the slightly less formal entertainments as illustrated below. 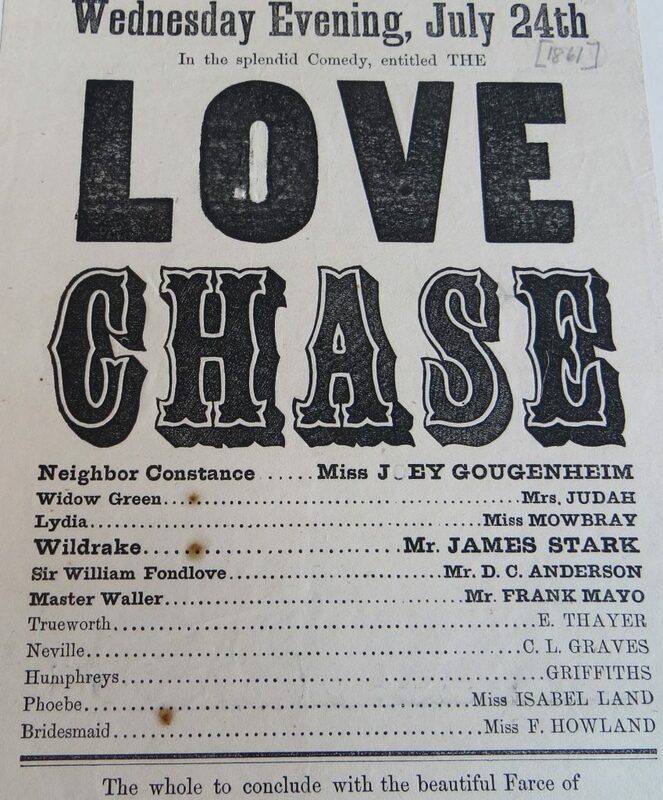 These broadsides all come from the Society’s Sherman Music Collection. 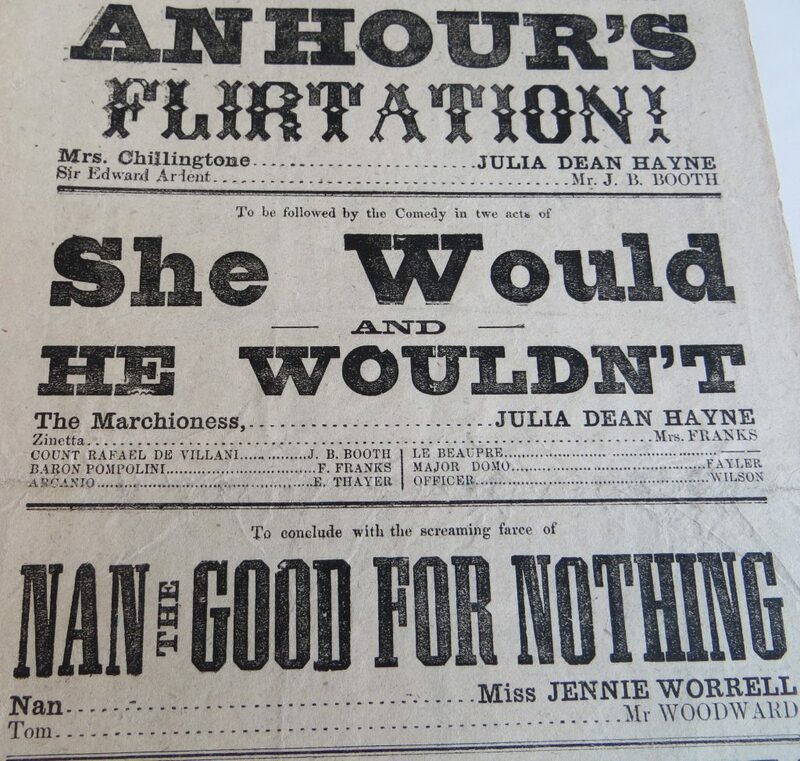 Titles such as the “Love Chase” and “She Would and he Wouldn’t”, “Nan the Good for Nothing” along with “An Hour’s Flirtation”, all were advertised by a printed broadside. Printed by local printers, meant to be put up on a building or on the front of the theatre, these would use a variety of type faces to attract the viewers attention and draw them into the show. Again, these items are ephemeral because after the event they were no longer useful. 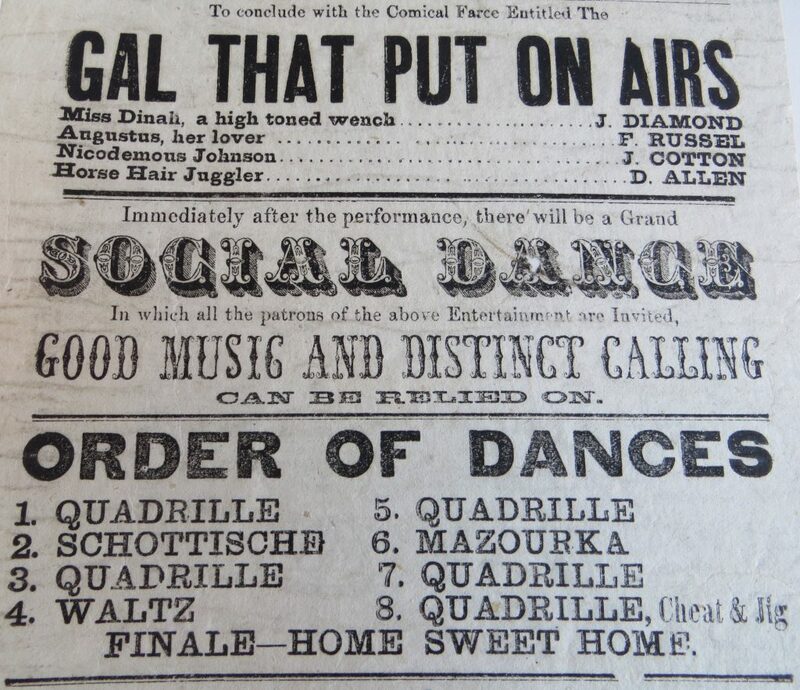 Dances were also advertised this way – often noting the dance would begin after a theatrical performance, such as in the “Gal that put on Airs”, followed by “…a Grand Social Dance..” The types of dances are often listed – such as a quadrille, a schottische and a waltz. The Schottische originated in Europe – most likely in Bohemia – and came to America in the 19th century. 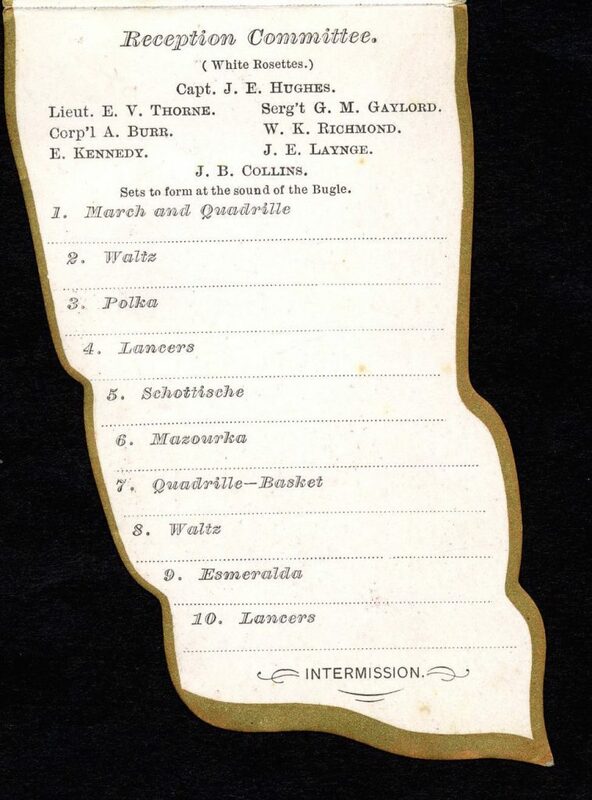 After 1848, a number of old ballroom variants of schottische were danced in California. The schottische basic step is made up of two sidesteps to the left and right, followed by a turn in four steps. In November of 1867, over two evenings, a Masquerade Ball was held. The songs to be sung are listed, as are the singers – and a note at the end, “..To conclude with a grand walk around…”. This derived from the Cake-Walk, which was a promenade around a ballroom, usually at the end of a dance. The name derives from the idea that the winner of a prize, most often a cake, participated in a Cake-Walk. This is generally thought to have originated among Black slaves on plantations in the southern United States. Nothing quite as exciting as concerts in the Haight during 1967, but for the 1860s, this was considered sprightly entertainment! Now, as the Summer of 2017 draws to a close, we can take a moment to look back at the summer of 1867 and see what the idea of “Love” meant to those inhabitants of San Francisco in the 1860s of our city. Even though the dress (corsets vs. tie-dye), food (Ghirardelli chocolates vs. hash brownies), smoking (a good cigar vs. marijuana), drink (champagne vs. box wine!) and music ( polkas and schottisches vs. Jefferson Airplane and The Doors) – might have been different, the idea of “Love” was still there. It was just expressed in more 19th century ways! Hope you’ve enjoyed a brief glimpse into the past, and what the summer of 1867 in San Francisco would have been like.